The origin of the hand fan can be traced back to the Egyptian dynasties, when they were used as far back as 2300 BC. The tomb paintings of the Egyptians show a royal procession holding a fan for the pharaoh. In fact, the treasures of King Tutankhamun (1352 BC) were found to contain two gold-handled ostrich hand fans. In later years, Assyrian art depicted them as well, when they were mostly used for ceremonial purposes. Hand fans were also used in India, Burma and China. Interestingly, monks also used the hand fan to block their site from women as well as the sun. Ultimately, this small decorative piece was passed down from Egypt to Greece and then Italy. The Greeks employed a single-leaf or heart shaped folding fan that can be seen in some of their statues. The Greeks also used a circular fan made of peacock feathers, appearing around the 5th century BC, and are constantly referred to in Greek writing. In the Roman Empire, the hand fan was first used to keep insects away from nobility. A servant would hold two long handles and protect a mistress while asleep or officials at a meeting from being bitten. In China, hand fans have been used since BC times but it wasn't until the Sung dynasty (960-1279 BC) that they began to be valued as works of art. By then, painting these decorative works of art was seen on the same level as painting scrolls. The Oriental folding fan was also used at funerals to shield the face and avoid endless greeting rituals. Today, these fans aren't used in the same practical sense they were hundreds and thousands of years ago. But people still appreciate them because of their elegance, design and artistic merit. Hand fans are typically used for decorative settings but can also be used as fashion accessories as well. Indeed, many Hollywood celebrities these days are bringing the Asian hand fan to events, which will only popularize their use. 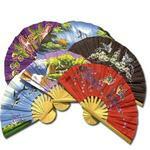 To see a complete line of outstanding Oriental hand fans, feel free to view our catalog.